After a regional road tour through Victoria to Adelaide and back – packed with produce of every kind – the best recipe for happiness at home was a quiet spot in the corner at local restaurant Pulp Kitchen, enjoying a very different meal in a very different restaurant, after almost two weeks of very good – and sometimes exceptional – food and drink. The best antidote to the enchroachment of winter nights in Canberra is to catch up with friends at a table in the corner of Pulp Kitchen in local hotspot, Ainslie. Ainslie is sometimes called the Red Centre, because it has the highest Labor vote in Australia – maybe it's all those disaffected public servants who’ve seen way too much behind the scenes. However it’s more of a local shopping hub, which along with the restaurant, sports a bar, a spectacular Breton café, patisserie and baker, a very good supermarket with an excellent delicatessen, and an elegant and inventive homewares shop. 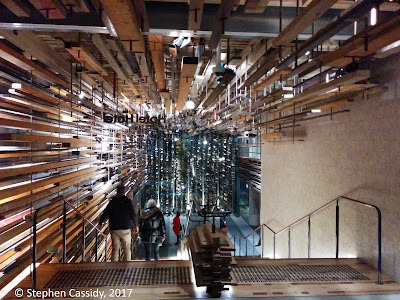 Our night out was soon after our return from a regional road tour through Victoria to Adelaide and back, which encompassed much eating and drinking of fine regional produce. 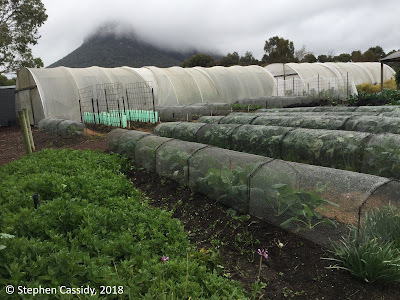 The trip culminated in a five course degustation dinner at Wickens Restaurant at the Royal Mail Hotel in Dunkeld, at the southern tip of the Grampian Mountains. Each of these two meals – in Dunkeld and in Ainslie – was very different, in very different restaurants. Yet they were both excellent in their own way, ­‘fit for purpose’ as they say. Fettucine vongole, garlic, lemon and chilli. At Pulp Kitchen we ate carefully prepared dishes and consumed carefully made wine to while away the night as autumn disappeared in the rear vision mirror. Being a relatively large group of five people meant that we could try a range of dishes. We started with three smaller dishes – kingfish, avocado and pickled ginger; smoked trout, chevre, beetroot and orange salad; and smoked cheddar soufflé, all of which were excellent and widely different in their flavours. With these three dishes, I knew the night had started exceedingly well. I’ve always been interested in the Royal Mail Hotel in Dunkeld, at the southern tip of the Grampians, and its varied offerings. It’s been one of Australia’s best regional restaurants for many years and I am particularly attracted by regional restaurants. I took advantage of a regional road tour through Victoria to Adelaide to update my first visit from several years before. In every respect the experience was worthwhile. The attention to detail and focused application was apparent, from the signature restaurant to the wider range of services it provides. On a recent regional road tour through Victoria to Adelaide and back, I had a number of dining experiences which were memorable – each in their own way. These ranged from a breakfast of sourdough toast with poached quince, pistachios and honey at Big Table at the renowned Adelaide Central Market – surely one of Australia’s great wonders – to a counter meal by a roaring fire at the Gilbert Hotel in Adelaide city and finished up with an excellent Wagyu corned beef with onion sauce, capers, peas and mash and fusilli with bolognese ragu at the Mountain View Hotel owned by the Pizzini family in Whitfield in the King Valley. The high point of the whole trip were two meals other than these, one during the trip and one soon after arriving back in Canberra. 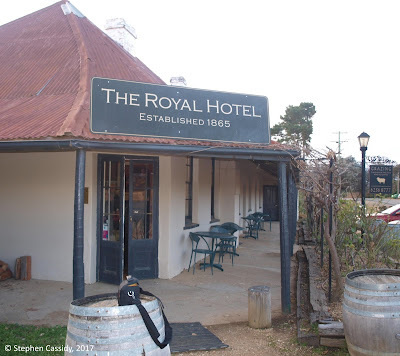 The first was at Wickens at the Royal Mail Hotel in Dunkeld, at the Southern tip of the ancient Grampians Mountains that rear up out of the flat plains around. The second – which I will write about in my next article – was at the local Pulp Kitchen restaurant in the heart of Ainslie, one of Canberra’s inner north suburbs. Each of these two meals were very different, in very different restaurants. Yet they were both excellent in their own way, ­‘fit for purpose’ as they say. The first experience was an encounter with the Royal Mail Hotel in Dunkeld and its signature restaurant, Wickens. This is one of the hottest restaurants in regional Victoria – even making it into the popular media by being featured on Master Chef a couple of weeks after the trip. I have been here twice since it changed hands and the capable crew from Restaurant eightysix in Braddon took over this Ainslie favourite, tucked away down the side of the shops. Each time it has been very good and very enjoyable. 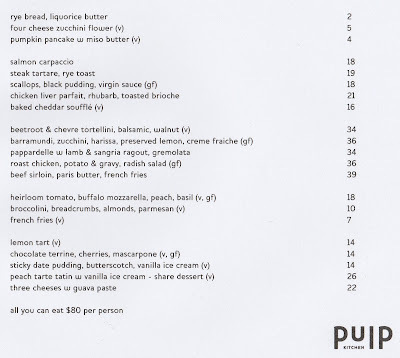 I used to really like the previous incarnation of Pulp Kitchen and went there many times but this is even better. I was there to catch up with an old friend from Adelaide I haven’t seen for decades. She had stopped in Canberra to get a Chinese visa on her way from the cold winds of Paros in the Aegean to collect her mail in Hong Kong, before heading to the 1,700 year-old porcelain centre, Jingdezhen, in Jiangxi Province, where she plies her trade as a maker of high class ceramics. I've always had a weak spot for Moss Vale in the Southern Highlands of NSW – I even got married just down the road from there, at Sutton Forest, one of the better and more enduring steps in my life. I have been watching it slowly change over the decades since. 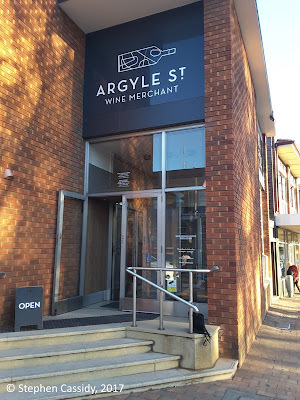 Argyle Street Wine Merchant entrance, on the corner of the main road through Moss Vale. I like the slightly worn feel that Moss Vale has, not to mention the fine steaks in its pub, which has been a finalist in important national meat awards. Given we have often stayed in many of the cottages at Pines Pastoral, just outside Moss Vale, and Pines is mainly a producer of quality beef, this seems appropriate. For a long time the town was the poor cousin to Bowral – where the well-off and famous came to live – but lately it has been blooming, with shops opening rather than closing, as used to be the case. Big city myopia, regional cities and cool capitals – is Canberra cool and who really cares? I’ve been entertained by the heated discussion over an article in the Canberra Times recently about whether Canberra is cool or not, written by one of it’s previous inhabitants who now lives in Melbourne. The question of regional cities and cool capitals is one that won’t go away, not helped by some of the superficial journalism that passes for content in the online world. Instead of endlessly comparing cities – Melbourne versus Sydney, Melbourne versus Canberra, Canberra versus Queanbeyan, Devonport versus East Devonport (as we did in my youth) – to gauge their degree of cool or of dismal, perhaps we’d be better seeking out the interesting places and features that lurk in every city, town and locality – including Canberra. The eye-challenging foyer of Hotel Hotel in NewActon. When I first moved to Canberra in 2000, as part of my own personal Olympic project, representing Australia in the well-established and popular sport of moving house, I wasn’t sure what I had come to. I was sick of the tizz of the big city—the late night parties and the unbanned substances, that probably should have been, the nicotine and plonk and shimmering vodka, clear as the conscience of a new-born child. In the end I galloped out of Sydney, like one of those wild grey horses that roam the Snowy Mountains—the ones that have now become far too prolific and need to be culled by gunshot from helicopters. Winter in Canberra can be cold and sharp. The last few weeks have been like that. In the morning it can be bitterly cold, though nothing in Australia even approaches a real cold climate. Still, when I was growing up in Tasmania, we used to get chilblains on the tips of our ears and the other morning as I was hanging out the washing it was so cold I thought it might happen again. Gebackene Mäuse - little mice, Austrian sweet yeast pastries. The pay off for the cold mornings is that with no cloud during the night the days are clear and blue and brilliant. That’s when Canberra comes into its own. That’s the time to enjoy a long luxurious lunch with friends. That’s exactly what we did last week, at Murrumbateman, one of the cool climate wine regions around Canberra. I can’t remember how many years I have been coming to this restaurant, in the tiny historic town of Gundaroo, just outside Canberra – it seems like forever. In the time I’ve been coming here Prime Ministers have risen and fallen, Governments have teetered, illusions have shattered. On the ground here in the country, they’ve built extensions, poured wine by the bucket and served food by the platter – and burned a tonne or two of firewood as well. Too many of the people I’ve enjoyed meals with here are no longer around to remember them but, thankfully, there’s enough of us to be getting on with. After settling down and removing a few layers of clothing I started with a local beer. All the tap beers are brewed by Canberra brewer Christoph Zierholz, whose brewery has been producing beer in Canberra since 2005. I settled for a glass of the Hopmeister, which has a slightly darker colour than many and a full flavour. Others at the table settled for a good alternative – a few glasses of the Wily Trout Blanc de Blanc sparkling before moving onto a bottle of the 2016 Nick O’Leary Riesling, with a seriously dry demeanour. The main entrance of the long-established Royal Hotel where Grazing Restaurant now resides. On previous visits I’ve found it hard to tear myself away from their seafood pie, which used to be served a as a main course. It could be challenging because it’s quite rich. However, they have now wisely reinvented it as an entrée. It’s a seafood pithivier of scallops, mussels and snapper, with creamed leek and smoked oyster emulsion. I think it’s even better as an entrée. I particularly like the fact that, even with the entrée they don’t stint on the pastry – a pie covered in pastry on the top only is not a pie at all to my mind. Quite a few of us had the pie. Another of our party had the fennel and sugar cured Spanish Mackerel, with duck prosciutto, almond and olive, and pronounced it very good. Probably the least satisfying was the breaded Crookwell lamb and kidney croquette, with apple slaw, Bredbo black garlic and hollandaise, with the comment that the kidney was not really identifiable. That would be a plus for me, since I’m not a big fan of kidney and thought the dish looked like a darker version of a fish finger, anyway. They must have already had a big day because the braised ox cheek, with walnut, Roquefort, carrot, anchovy and spinach had run out entirely. Instead they were offering a lamb Scotch fillet with fennel and various other things I can't remember. Several of our party opted for that – though they were disappointed because although it was very flavoursome, it was slightly stringy in texture. There was one serving left of an intriguing dish, the pressing of duck, with parsnip toffee, pickled rhubarb and pork crackle but as interesting as it sounded, we had other fish to fry. Most of the rest of us chose the organic boned and rolled whole roast hen, with chestnuts, cabbage, bacon and parsnips, which though a little too salty, was a triumph. The fish pie followed by the chicken was a complete success, so I was happy. A couple of us felt like red wine, so we shared a bottle of 2015 Pinot Noir from Lerida Estate at Lake George, which was excellent with the chicken. I almost wasn’t going to have dessert but I was strong-armed into it so my dining companion could try my dish. I had the burnt honey cream, with ginger and orange blossom poached pear, Iron Bark honey jelly and candied pastry, which I found very enjoyable. Others had the apple splice, which according to the menu was Granny Smith apple and tarragon sorbet, Earl Grey infused ice cream, apple ‘salsa’ and meringue wafers – except that the Earl Grey had disappeared and it had become strawberry ice cream instead and the tarragon sorbet had gone missing in action as well. Despite this it was also pronounced a success – though lingering sadness at the missed opportunity to try the distinctive flavour of Earl Grey was evident. One lone adventurer had the caramel salted hazelnut, with frozen caramel custard, salted hazelnut praline, chocolate parfait, chocolate aero and cocoa fragments, and gave it the thumbs up. With my dessert I had a glass of the Gundog Estate NV Muscat from Rutherglen in Victoria, while a fellow diner tried the Morris Tokay from the same region. Both were full of flavour and dark colour – quite different choices, but both enjoyable. I used to be very fond of Muscat when I lived in Adelaide many decades ago, but I haven’t had many since, so it was a memorable pleasure. Gundog Estate has taken over the old building at the rear of Grazing, an annexe that has housed a string of smaller operations. We inspected it after lunch and it looked impressive, with a warm and cosy space for winter and a pleasing deck for warmer months. 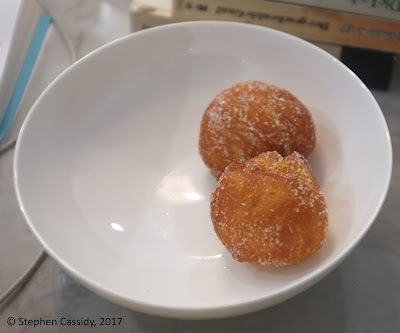 One of the pitfalls of the food blogger is getting so caught up in enjoying the food and the fun of sitting around chatting with a lively group over fine food and drinks that you forget to take any photographs. It’s not embarrassment at taking photos of your food. I’ve long since got over that – after all, what better thing is there to photograph? The problem is just general neglect of photography – I think I’ve realised that you can’t be a part-time photographer, even at dinner. In this case, some of the dishes, as well as being excellent, looked superb. The much enjoyed fish pie and rolled chicken shall, alas, forever remain invisible. However, the solution is to go there yourself, hunker down over an open fire or in a private room, savour the local beer and wine and see for yourself what the food tastes, smells, looks and feels like. It will make you happy. 'Life on the land and at the table, the companion Facebook site to this blog, for brief and topical snippets and vignettes about land to table – the daily routine of living in the high country, on the edge of the vast Pacific, just up from Sydney, just down from Mount Kosciuszko', 'tableland' on Facebook. ‘I have been here twice since it changed hands and the capable crew from Restaurant eightysix in Braddon took over this Ainslie favourite, tucked away down the side of the shops. Each time it has been very good and very enjoyable. 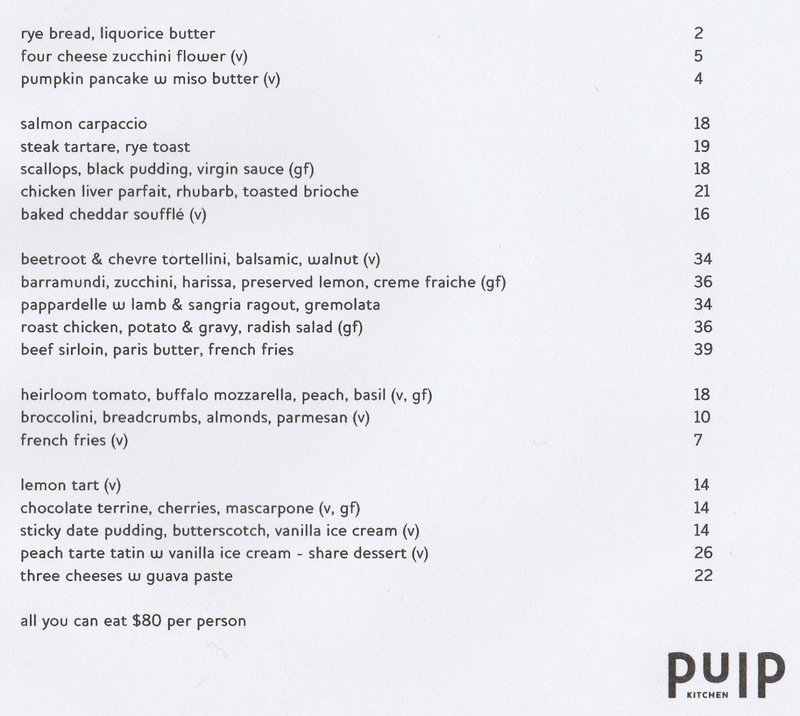 I used to really like the previous incarnation of Pulp Kitchen and went there many times, but this is even better. I was catching up with a friend I hadn’t seen for many decades and it made for an excellent night in a buzzy, busy venue in the heart of the inner North’, Catching up in the kitchen – Pulp Kitchen delivers the goods. ‘I've always had a weak spot for Moss Vale in the Southern Highlands of NSW. I have been watching it slowly change over the decades since. The latest addition is a new and very funky bar, Wine Mosaic Lounge, combined with a wine vendor, Argyle Street Wine Merchant. Passing through, we stopped to sample it. We thought aloud ‘we must come back here soon’ – and we will’, Wine o’clock in downtown Moss Vale. 'I’ve been entertained by the heated discussion about whether Canberra is cool or not. The question of regional cities and cool capitals is one that won’t go away. Instead of endlessly comparing cities – Melbourne versus Sydney, Melbourne versus Canberra, Canberra versus Queanbeyan, Devonport versus East Devonport (as we did in my youth) – to gauge their degree of cool or of dismal, perhaps we’d be better seeking out the interesting places and features that lurk in every city, town and locality', Big city myopia, regional cities and cool capitals – is Canberra cool and who really cares? ‘The pay off for cold Canberra mornings is that with no cloud during the night the days are clear and blue and brilliant. That’s when Canberra comes into its own. That’s the time to enjoy a long luxurious lunch with friends. The ACT is so tiny that is doesn’t take long before you have to cross the border in your quest for food and drink and spectacular landscapes. These outings are the slices of life in between the restaurants and bars where you go out in public. This is where the farmers markets and the home-grown produce and the local vintages come together in the privacy of your own home. With moments like this, even winter starts to look attractive’, Travelling overseas in your own country ­– Austrian winter lunches in the high country. 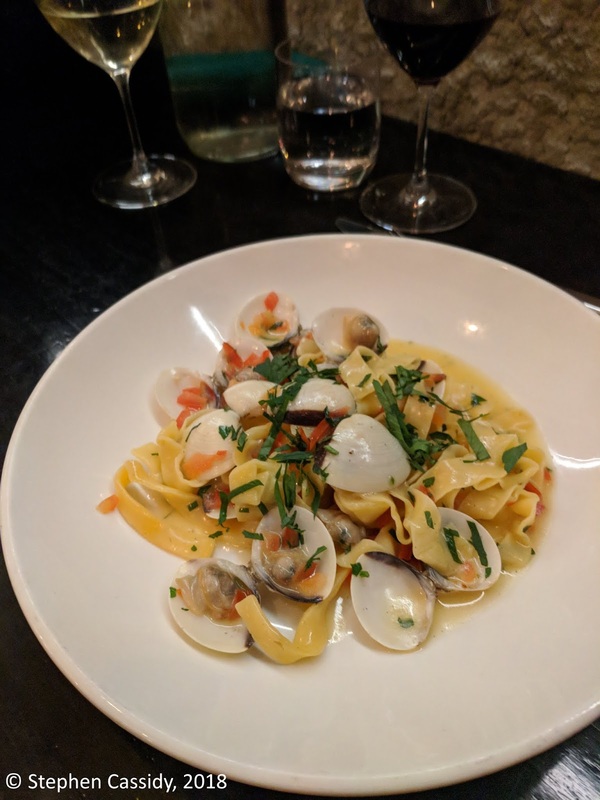 ‘I seem to spend a lot of time in the small Italian and Sons restaurant in hipster heaven in downtown Braddon, with its equally small bar annexe, Bacaro, at the rear. It’s so good and so pleasant that it’s easy to forget the other parts of the Italian empire. The flagship restaurant, Mezzalira, is across the the city, near the National University. It’s in the fabulous but somewhat neglected though stately Melbourne Building, with its Italianate arches and colonnades. I sometimes think that if suddenly the world was about to end (a bit like contemporary times) and I was offered the choice of only one cuisine until the crunch, I’d have to choose Italian. That way I could die happy,’ Mezzalira Ristorante – the Italian empire strikes back. ‘Because the high country is adjacent to the low country, it takes only three hours to drive from the nation’s capital to the nation’s financial capital. In the early to mid 1990s Chippendale in Sydney was a suburb you travelled through to get somewhere else. All that is changing in a big way, with plenty there to explore. A sure sign of these times is eatery Ester, a restaurant that reflects the focus of its name on the science of food with some intrepid experiments in the culinary arts’, Ester – the sweet smell of success. ‘Tucked away in a corner at the Ainslie shops where it’s easy to miss entirely ­– in the heart of the suburb know as the Red Centre for it’s exceptionally high Labor vote – is an unexpected delight. The location has hosted a series of less than successful ventures but this most recent has been an unqualified success. Who would have thought that a cafe hailing from Brittany could attract such a crowd. The secret of success is that it focuses on what it does and it does it well. You can park yourself inside the small venue or outside if the weather is fine and pick from some unexpected sweet pastries, throw down the odd glass of French wine or eat buckwheat pancakes or baguettes. The cafe also runs to daily specials that can be very unexpected. Long may it reign over us – Rule Brittany rather than Rule Britannia’, In a corner with a cake (or two) – the hidden attraction of local hangouts. ‘I realise I may have just become a statistic. I have a suspicion that I have eaten more sorbet, gelato and icecream since local Canberra icecream outlet Frugii opened in Canberra’s Braddon perimeter than I have eaten in my whole previous life. Tucked away in hipster heaven, it keeps churning out flavours, in an ever changing smorgasbord of coldness’, We all scream for icecream – cooling down in a cold climate with Frugii. ‘On a bustling Friday night in hipster heaven, I popped into my favourite Canberra restaurant, Italian and Sons, planning for little more than a quick bite to eat. I managed to get my favourite spot – when I’m not settled comfortably in Bacaro, the adjoining bar out the back, that is – sitting in the window, watching the action on the street. I headed straight for a real blast from my Adelaide past, part of my earliest discovery of Italian cuisine – saltimbocca. Then I beat a path down Lonsdale Street to Frugii, Canberra’s own dessert laboratory. What is happening to this city? It’s getting cooler by the minute and it’s not just the icecream or the approach of winter’, A bustling Friday night in hipster heaven. ‘Pod Food is in the heart of the slightly ramshackle gardening and nursery hub of Canberra, Pialligo , adjacent to the burgeoning exercise in urban growth called Canberra Airport. It was always the place you went to get large pots and even larger apples. Pod Food was always good enough – but now it is something a whole lot more impressive. On a rainy Friday I entered through their marvellous cottage garden entrance way to sit on the covered and contained outside deck. The entrance to Pod Food, formerly part of an operating nursery, is the sort of garden I eventually want to have. It felt highly suitable sitting at the entrance to the Australian high country as the rain came down, drinking the fine product of another high region on the opposite side of the world’, Peas in a pod – food takes off. ‘It had been quite a week and I had been crushed by too many encounters with the crazy world of Centrelink as I fulfilled my long list of aged care responsibilities. I needed cheering up so last night ate out at the venerable Italian and Sons, the very first of the many funky venues which now enliven Braddon. My attention was drawn to the rare appearance of vitello tonnato. My imagination had been captured decades ago when I was a young boy by seeing the recipe for the dish in Margaret Fulton’s classic cookbook. I finally tried it in a tiny restaurant in Florence, during my first visit overseas, after a stint at the massive Frankfurt Book Fair in 1989. This most recent one was the best I have ever eaten outside my own home – well, perhaps the best anywhere. This is a favourite place, probably my most favourite in Canberra. Coming here always makes me feel happy and what more can you ask?’, Vitello Tonnato for a life well lived in hipster heaven. 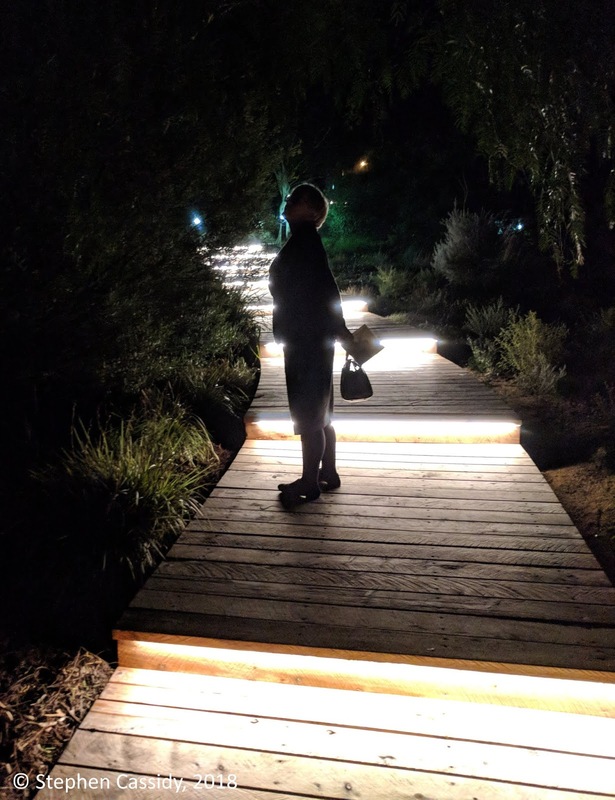 ‘On a day and night which was bitterly cold – as cold as Canberra has been this year, with the hint of snow clouds overhead – I was reminded why I live here. As we wandered along after a full day of cultural institutions and design events, looking for somewhere to eat we impetuously popped into Restaurant Eightysix and even more impetuously were able to get a table. I had forgotten reading somewhere that famed long-former Adelaide chef, Christine Manfield was here for the month, cooking up an Asian-inspired menu. How much better could it get?’, Eating out in a cold, funky city – Canberra comes of age in the Asian Century. ‘Where the market gardens that supplied Canberra as far back as the 1820s used to be a small fortune has been spent turning 86 acres overlooking the Eastern end of Lake Burley Griffin into a superb regional restaurant, Pialligo Estate Farmhouse Restaurant. It made for a tremendous birthday lunch in a spacious airy and light space, full of exciting food treated well. I couldn’t take my eyes off the copper guttering and downpipes. I thought all the loose copper in the world had already been stolen but clearly it’s still available. It’s quite clear that even though work is still being finalised, when it is finished it will be a spectacular addition to the nation’s capital and the region’, Smoking for broke beside the Molongolo. ‘When I first moved to Canberra, almost as an accidental intersection of geography and employment after the Sydney Olympics, I used to say “if you had lived in Sydney and one day you woke up and discovered you were in Canberra, you would think you had died.” Then I changed my mind. It took ten years but it was inevitable. Berrans are a hardy bunch – they can withstand the hot winds of summer and of Australia’s Parliament, the chill flurries from the Snowy Mountains and the chilling news of budget cuts. The Berra is half-way between everywhere’, In praise of the Berra. The daily routine of living in the high country – the Southern Tablelands of the eastern seaboard of Australia. Planting and growing, cooking and eating (and drinking) – and the arts and culture that springs from it and celebrates it. On the edge of the vast Pacific, just up from Sydney, just down from Mount Kosciuszko.